‘ONE WEEK OLD’, ‘HARRY WINSTON’ was painted from life. This foal was bred by Harriet Glen. 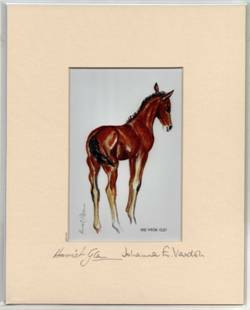 Harriet Glen, a talented and accomplished jewellery designer and sculptress, kindly donated this picture from her private collection to Johanna Vardon to raise funds for the National Foaling Bank. Unique! The mount has been signed by both Harriet Glen and Johanna Vardon MBE. The print has been reproduced on Premium quality, heavyweight, bright white 150g paper, specifically developed for high definition colour graphics. Fade resistant. For over 40 years Johanna has offered an invaluable service to UK horse breeders to pair foals orphaned at or soon after birth with mares that have lost their own foals. sculptress and designer of beautiful jewellery.